What's New with the Great Hall Project? Can you hear that? It’s the faint hum of construction equipment in the distance. And it’s getting closer, but there is still more work to be done behind the scenes. Since the start of the year, DEN and Great Hall Partners have focused on the design of the new Great Hall, with a lot of help from our friends. We have been working closely with TSA, our airline partners and concessionaires to help design a Great Hall experience that will be efficient and enjoyable for our business partners and our passengers. As we near the start of construction this summer, activity in the terminal will increase. In fact, you may have noticed that some airlines have already moved their check-in counters to new, temporary spaces, and you can expect more movement in the coming weeks. You will also start to see a few of our shops and restaurants in Jeppesen Terminal close in preparation for construction. After the project begins this summer, you will see construction walls and new wayfinding signage in the terminal. Not to worry, however, we won’t re-build the entire terminal at once. 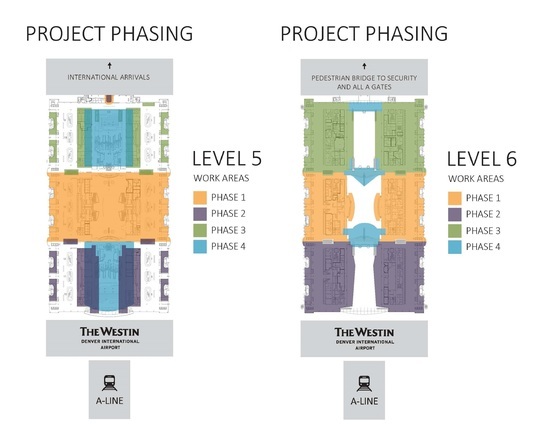 Note: The map below depicts approximate work areas for the four different phases of the project. We will provide more details about project phasing, including specific components of each phase, in future editions of this newsletter. To see the full-size version, click here. As construction approaches, you may be wondering what’s happening to your favorite Jeppesen Terminal concessions. In general, dining and shopping options in Jeppesen Terminal will be limited throughout the project, as all existing concessions will close eventually. The good news is the closures will happen in phases. And, we are actively working to secure temporary concessions in the terminal to help bring some food and beverage options to our passengers. The goal is to have temporary concessions in place over the next couple of months. 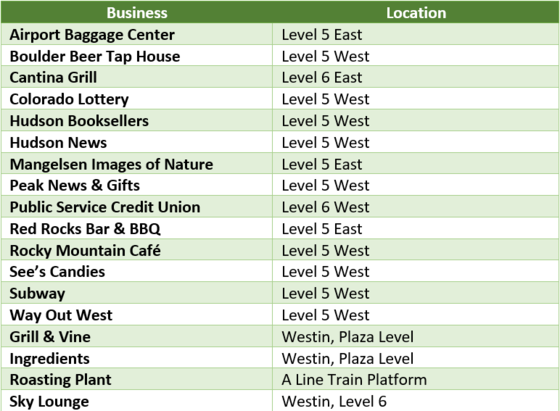 And, don’t forget, there are several great dining options at the Westin Hotel and Transit Center. You can enjoy breakfast, lunch or dinner at the Grill & Vine, or coffee and quick snacks at Ingredients both located on Level 5 of the Westin. You can also enjoy coffee and snacks at Roasting Plant on the train platform level (Level 2) of the Transit Center. We are also excited to announce that this summer, Tom’s Urban — a restaurant/brew pub — will open on Level 5 of the Westin. We encourage passengers to arrive early, check in and get through security where there are even more wonderful dining and shopping options available on A, B and C concourses. Below is a list of concessions that are already saying their goodbyes as well as those that will remain open during Phase 1. As part of the initial round of concession closures leading up to the Great Hall Project, the U.S. Post Office on Level 6 West is now closed. For passengers who enter security with prohibited items and need to mail them, that option will still be available directly at the TSA checkpoints via Airport Mailers. TSA representatives will provide information to passengers as needed. While mail services will be limited during construction, we are planning on adding a business center to Level 6 in the corridor leading to A Gates. We will share more information about this future amenity as details are finalized. The DEN U.S. Post Office was a sub-station of the Montbello Station Post Office. Customers can contact this office at 303-371-8783 for information about applicable P.O. Box refunds. The Montbello location offers 24-hour lobby access, window service from 9 a.m. to 6 p.m., Mondays through Fridays, and from 9:30 a.m. to 12:30 p.m. on Saturdays. To find other U.S.P.S. locations, visit https://m.usps.com/m/POLocatorAction. Last month, Great Hall Partners, the team selected as the developer for the Great Hall Project, launched the process to determine who will reside in the new concession spaces in the Great Hall. The online application for the RFP process is open now at rfp.greathallpartners.com and closes on June 12. To make way for the first phase of construction, which will begin to consolidate ticket counters, several airlines will move their check-in counters to temporary locations. In fact, some have already moved. Airline moves will continue through much of the project until work on the ticket counters is complete in early 2020. For the latest look at airline ticket counter locations, please click here. 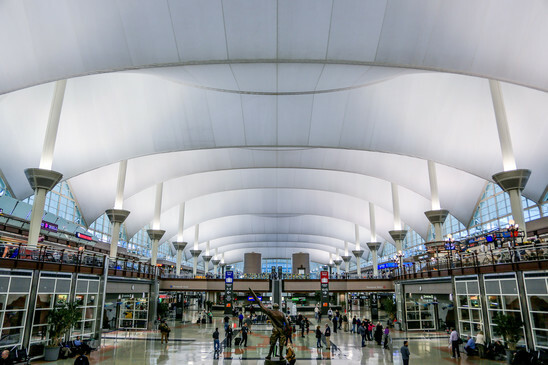 DEN has launched a comprehensive, online listing of jobs available at the airport. This listing service includes airport positions, along with airline, shops and restaurants at the airport. Look for your next career opportunity at jobs.flydenver.com. The Great Hall of Denver International Airport's Jeppesen Terminal.